Intelligent AR (21.04.2016) - XLVIII Feria Nacional del Sello 2016 (National stamps fair). Code B4ES16 ES01. Special imprint ' 21-24 Abril 2016 Madrid '. Pictorial first day cover with the four ATMs issued in the fair, domestic mail (4 x Tarifa A). Pictorial first day postmarks. Signed by the ATM designer. Intelligent AR (21.04.2016) - XLVIII Feria Nacional del Sello 2016 (National stamps fair). Code B4ES16 ES01. Special imprint ' 21-24 Abril 2016 Madrid '. Two mint ATMs, domestic mail (2 x Tarifa A). Intelligent AR (21.04.2016) - XLVIII Feria Nacional del Sello 2016 (National stamps fair). Code B4ES16 ES01. Special imprint ' 21-24 Abril 2016 Madrid '. Two mint strips of four ATMs, domestic mail (2 x 4 x Tarifa A), with the corresponding receitps. Intelligent AR (21.04.2016) - XLVIII Feria Nacional del Sello 2016 (National stamps fair). Code B4ES16 ES01. Special imprint ' 21-24 Abril 2016 Madrid '. Two mint ATMs, domestic mail (2 x Tarifa A), with the corresponding receipt. Intelligent AR (21.04.2016) - XLVIII Feria Nacional del Sello 2016 (National stamps fair). Code B4ES16 ES01. Special imprint ' 21-24 Abril 2016 Madrid '. Two mint ATMs, domestic mail (2 x Tarifa A), with the corresponding first day of issue receipts. Intelligent AR (21.04.2016) - XLVIII Feria Nacional del Sello 2016 (National stamps fair). Code B4ES16 ES01. Special imprint ' 21-24 Abril 2016 Madrid '. Two covers mailed to Spain (2 x Tarifa A). Mechanical postmarks CTA MADRID 22.04.16. Intelligent AR (21.04.2016) - XLVIII Feria Nacional del Sello 2016 (National stamps fair). Code B4ES16 ES01. Special imprint ' 21-24 Abril 2016 Madrid '. Two first day covers with the two ATMs, domestic mail (2 x Tarifa A). Pictorial first day postmarks 'ATM Punto Filatélico'. Intelligent AR (21.04.2016) - XLVIII Feria Nacional del Sello 2016 (National stamps fair). Code B4ES16 ES01. Special imprint ' 21-24 Abril 2016 Madrid '. 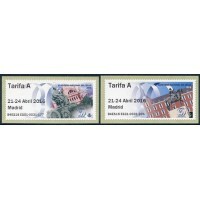 Two pictorial first day covers with the four values sets (2 x Tarifa A - A2 - B - C) and the corresponding receipts. Pictorial first day postmarks 'ATM Punto Filatélico'. Intelligent AR (21.04.2016) - XLVIII Feria Nacional del Sello 2016 (National stamps fair). Code B4ES16 ES01. Special imprint ' 21-24 Abril 2016 Madrid '. Two first day covers with the four values sets (2 x Tarifa A - A2 - B - C) and the corresponding receipts. Pictorial first day postmarks 'ATM Punto Filatélico'. Intelligent AR (21.04.2016) - XLVIII Feria Nacional del Sello 2016 (National stamps fair). Code B4ES16 ES01. Special imprint ' 21-24 Abril 2016 Madrid '. Two first day covers mailed to Spain (2 x Tarifa A). Pictorial first day postmarks 'ATM Punto Filatélico'. Intelligent AR (21.04.2016) - XLVIII Feria Nacional del Sello 2016 (National stamps fair). Code B4ES16 ES01. Special imprint ' 21-24 Abril 2016 Madrid '. Eight first day covers mailed to different countries, franked with the two sets of four values (2 x Tarifa A - A2 - B - C). All the covers with postal indexations. Intelligent AR (21.04.2016) - XLVIII Feria Nacional del Sello 2016 (National stamps fair). Code B4ES16 ES01. Special imprint ' 21-24 Abril 2016 Madrid '. Maximum card with ATM, domestic mail (Tarifa A). Pictorial first day postmark 'XLVIII Feria Nacional del Sello - Correos 300 Aniversario'. Postcard, Ediciones A.M. Intelligent AR (21.04.2016) - XLVIII Feria Nacional del Sello 2016 (National stamps fair). Code B4ES16 ES01. Special imprint ' 21-24 Abril 2016 Madrid '. Maximum card with ATM, domestic mail (Tarifa A). Pictorial first day postmark 'ATM Punto Filatélico'. Postcard, Ediciones A.M. Intelligent AR (21.04.2016) - XLVIII Feria Nacional del Sello 2016 (National stamps fair). Code B4ES16 ES01. Special imprint ' 21-24 Abril 2016 Madrid '. Maximum card with ATM, domestic mail (Tarifa A). Pictorial first day postmark 'ATM Punto Filatélico'. Postcard, Ediciones del O.K. Corral. Intelligent AR (21.04.2016) - XLVIII Feria Nacional del Sello 2016 (National stamps fair). Code B4ES16 ES01. Special imprint ' 21-24 Abril 2016 Madrid '. Maximum card with ATM, domestic mail (Tarifa A). Pictorial first day postmark 'ATM Punto Filatélico'. Postcard, Editorial Fisa Escudo de Oro S.A. Intelligent AR (21.04.2016) - XLVIII Feria Nacional del Sello 2016 (National stamps fair). Code B4ES16 ES01. Special imprint ' 21-24 Abril 2016 Madrid '. Maximum card with ATM, domestic mail (Tarifa A). Pictorial first day postmark 'ATM Punto Filatélico'. Postcard, Ediciones 07. Intelligent AR (21.04.2016) - XLVIII Feria Nacional del Sello 2016 (National stamps fair). Code B4ES16 ES01. Special imprint ' 21-24 Abril 2016 Madrid '. Two maximum cards with ATMs, domestic mail (2 x Tarifa A). Pictorial first day postmarks 'ATM Punto Filatélico'. Intelligent AR (21.04.2016) - XLVIII Feria Nacional del Sello 2016 (National stamps fair). Code B4ES16 ES01. Special imprint ' 21-24 Abril 2016 Madrid '. Two mint four values sets (2 x Tarifa A - A2 - B - C) and the corresponding receipts, first day of issue. Intelligent AR (21.04.2016) - XLVIII Feria Nacional del Sello 2016 (National stamps fair). Code B9ES16 B004. Special imprint ' 21-24 Abril 2016 Madrid '. Two mint ATMs (2 x Tarifa A2). Intelligent AR (21.04.2016) - XLVIII Feria Nacional del Sello 2016 (National stamps fair). Code B9ES16 B004. Special imprint ' 21-24 Abril 2016 Madrid '. Pictorial cover with the two four values sets (2 x Tarifa A - A2 - B - C). Special postmarks PHILATAIPEI 2016. Intelligent AR (21.04.2016) - XLVIII Feria Nacional del Sello 2016 (National stamps fair). Code B9ES16 B004. Special imprint ' 21-24 Abril 2016 Madrid '. Two mint four values sets (2 x Tarifa A - A2 - B - C). Intelligent AR (21.04.2016) - XLVIII Feria Nacional del Sello 2016 (National stamps fair). Code B9ES16 B004. Special imprint ' 21-24 Abril 2016 Madrid '. Two four values sets (2 x Tarifa A - A2 - B - C). Special postmarks PHILATAIPEI 2016.